An all-natural, innovative instant sauce mix for the classic Thai dipping sauce namprik kapi. This sauce has a very strong smell and stays on your breath for a long time, so be prepared. We also have a recipe for home-made namprik kapi but this instant powder is more convenient and just as delicious. 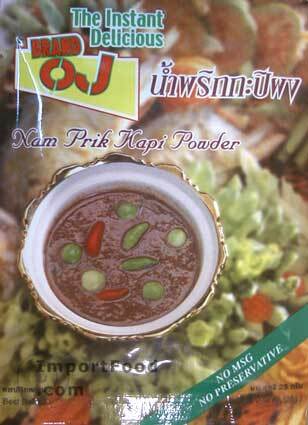 Ingredients: shrimp paste powder, sugar, salt, lime juice powder, chilli, garlic. Product of Thailand.